Offering you a complete choice of products which include my first coloring book (pink), my first coloring book (blue) and my first coloring book (green). Backed by an adept team of vendor’s professionals, we are offering a wide range of My First Coloring Book (Pink). Offered My First Coloring books are printed by using the premium grade inks & designed using high quality of paper employing advance machines at vendor’s end. We offer our My First Coloring books in diverse sizes & customized options according to the client’s demand. 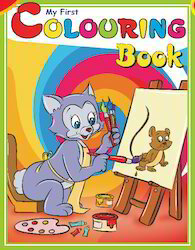 Our valuable customers can avail these My First Coloring books from us within a given time frame at affordable rates. We are occupied in offering an exquisite range of My First Coloring Book (Blue). Our My First Coloring books are printed at vendor’s end using the top quality ink and optimum quality of paper along with modern machines. Offered My First Coloring Books are checked by experts on numerous parameters so as to ensure its quality before dispatch. These My First Coloring books are accessible in various sizes, printing & customized options according to the requirements of clients. Over the years, we have been able to establish ourselves as a prominent figure in this industry by offering My First Coloring Book (green). These my first coloring books are designed using superior quality of paper & printing ink in accordance with the quality standards. Our offered my first coloring books are thoroughly checked by knowledgeable professionals in order to ensure their correct concept and correct content. We offer these my first coloring books in numerous customized options at reasonable price. Looking for My First Colouring Book ?